Majinder Singh Sirsa and Om Prakash Sharma were marshalled out after they kept interrupting a discussion on a resolution moved by Transport Minister Kailash Gahlot against the proposed fare hike. 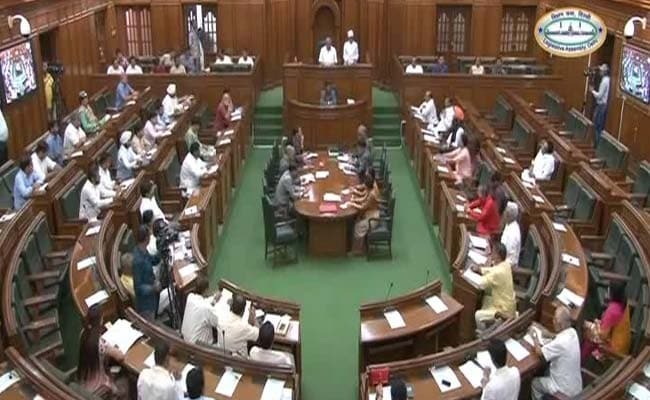 New Delhi: Two Bharatiya Janata Party (BJP) law-makers were removed and two others walked out of the Delhi Assembly on Monday during a discussion on the proposed Metro fare hike. After this, the other two BJP law-makers -- Jagdish Pradhan and Vijender Gupta -- walked out of the house. The Aam Aadmi Party government has locked horns with the Delhi Metro Rail Corporation over the fare hike to be enforced from October 10 -- the second this year. The last hike was effected in May. The resolution moved on Wednesday by Mr Gahlot urged the Ministry of Urban Development to "quickly and actively intervene" so that the proposed "unlawful and anti-people fare hike" be reversed in the interest of the common people and the environment. All four BJP law-makers kept on interrupting the discussion, demanding action against Chief Minister Arvind Kejriwal over a comment he made against the BJP MLAs last week in the House. Speaker Ram Niwas Goel ordered the removal of the law-makers saying that the discussion on the resolution was extremely important as fares were set to go up from Tuesday.